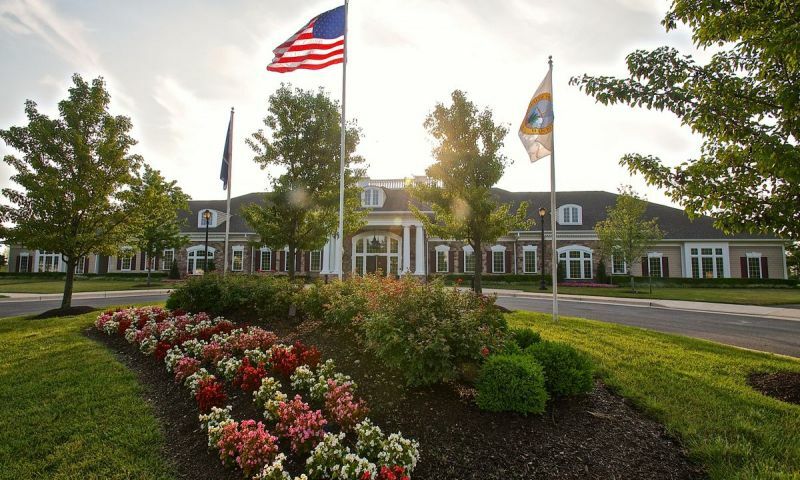 Four Seasons at Historic Virginia in Dumfries is a gated community that is restricted to residents aged 55 and better. This beautiful community contains many exciting features including a 21,000 square-foot clubhouse, state-of-the-art fitness center, outdoor swimming pool and spa, tennis courts and much more. Four Seasons offers many social clubs cover a wide variety of interests and give residents many opportunities to get to know their neighbors. The community's prime location is set beside the natural beauty of the Prince William Forest Park and only 28 miles south of Washington, D.C. The surrounding areas include the perfect mix of historic districts, modern-day suburban centers and beautiful natural settings. Four Seasons impressive 21,000 square-foot clubhouse offers a variety of amenities that will appeal to active adults. The state-of-the-art fitness center includes both cardiovascular and strength training equipment as well as an indoor swimming pool with lap lanes. The clubhouse also contains a billiards room, card rooms, a library, lounge, ballroom, arts and crafts room, and learning center. Residents can also enjoy visiting the cyber cafe and coffee bar. Outdoors, Four Seasons at Historic Virginia offers a swimming pool and spa complex, two tennis courts and bocce ball courts. Golf enthusiasts will enjoy the putting green and driving station, and everyone who lives at Four Seasons will appreciate the well-maintained walking trails. Four Seasons at Historic Virginia features luxurious one-story single-family homes. These thoughtfully designed homes range in size from 1,500 to 2,500 square feet and include a variety of features that appeal to an active adult lifestyle. These low-maintenance homes include vinyl siding, decorative exterior lighting, and insulated front entry doors. Inside, Four Seasons beautiful homes have many sought-after features such as nine-foot ceilings in the main living area, crown molding and chair rail details, lever handle interior door hardware, designer kitchens and spacious floor plans. Residents of Four Seasons at Historic Virginia enjoy an active lifestyle that makes use of the community s many amenities and social clubs. The staff at Four Seasons includes a fitness director, social activities director and a concierge to help residents arrange their activities. With so many on-site activities and community events, residents can make their schedule as full as they would like. Four Season s many social clubs cover a range of interests that are sure to appeal to new residents. Community organizations feature special interest groups and clubs that primarily focus on socializing. Whatever their interests, residents can find many ways to get to know their neighbors and explore new hobbies. Situated within Prince William County, the city of Dumfries enjoys a prime location with close proximity to many dining, shopping and cultural attractions. Downtown Washington, D.C., only 28 minutes to the north, offers monuments, museums, theatres, shopping and fine restaurants. The nearby Potomac River adds boating and fishing opportunities. Only minutes away, Prince William Forest Park features 17,000 unspoiled acres of natural beauty. The surrounding area also contains many historic districts such as Old Town Alexandria, Old Town Fairfax and Old Town Manassas. For modern day shopping and dining, it s hard to beat the selection available at Tyson s Corner in nearby McLean. There are plenty of activities available in Four Seasons at Historic Virginia. Here is a sample of some of the clubs, activities and classes offered here. There is so much to do and so many nice people to spend time with. We weren't sure w were ready for this, but it is the best decision we ever made. Love it here! We love living in this private community. It is very quiet and private. The entry is gated and all the people here take good care of their homes. It's got nice curb appeal, the clubhouse is fantastic and there are lots of activities. The local area is very nice with lots of shops and restaurants plus DC is only about a half hour away. 55places.com is not affiliated with the developer(s) or homeowners association of Four Seasons at Historic Virginia. The information you submit is distributed to a 55places.com Partner Agent, who is a licensed real estate agent. The information regarding Four Seasons at Historic Virginia has not been verified or approved by the developer or homeowners association. Please verify all information prior to purchasing. 55places.com is not responsible for any errors regarding the information displayed on this website.